Yoga Mudrasana (योग मुद्रासन – Yoga Mudrasana in Hindi) or The Psychic Union Pose is a deep forward bend yoga pose. It is an excellent Yoga Pose for massaging the abdominal organs and removing constipation. This asana imparts humbleness and modesty to a practitioner. It also brings grace and humility to a practitioner. Yoga Mudrasana stimulates the Manipura Chakra, which is the Powerhouse of the body or the center of vitality. The Psychic Union Pose or Yoga Mudrasana is an advanced yoga pose and as such beginners may find it difficult to perform. To practice Yoga Mudrasana or The Psychic Union Pose, Spread a Yoga Mat and sit in padmasana on it and close your eyes. Relax your whole body while breathing normally in this position. Hold your hands behind, one hand grasping the wrist of another hand. Inhale deeply first and while exhaling bend forward, keeping your spine straight. Bring your forehead to the floor or as close to the floor as possible while getting into Yoga Mudrasana, without straining any part of your body. Relax your whole body in the final the Pose, breathing slowly and deeply with your awareness in the nostril. Remain in the final Pose of Yoga Mudrasana for one to two minutes or as long as is comfortable to you. Remember that you should not strain your back or ankles or knees or thighs by forcing your body to stay in the final pose. Practice 3 rounds, with some rest between each round. People suffering from spinal injury, severe back problem and cervical or lumbar spondylosis should not practice Yoga Mudrasana. People suffering from hypertension, serious cardiac or eye conditions should avoid practicing this asana. Those in the early post-operative or post-delivery period should not attempt Yoga Mudrasana. Yoga Mudrasana is an excellent Yoga Pose for massaging the abdominal organs and removing constipation. It nicely and gently stretches the posterior muscles of the trunk and the neck. This asana tones the spinal nerves which emerge from the spaces between the vertebrae, thus contributing to good overall health. Yoga Mudrasana or Psychic Union Pose practice has been used by Yogis to awaken Manipur Chakra. Regular practice of Yoga Mudrasana will improve the concentration and bring a sense of balance in the body. 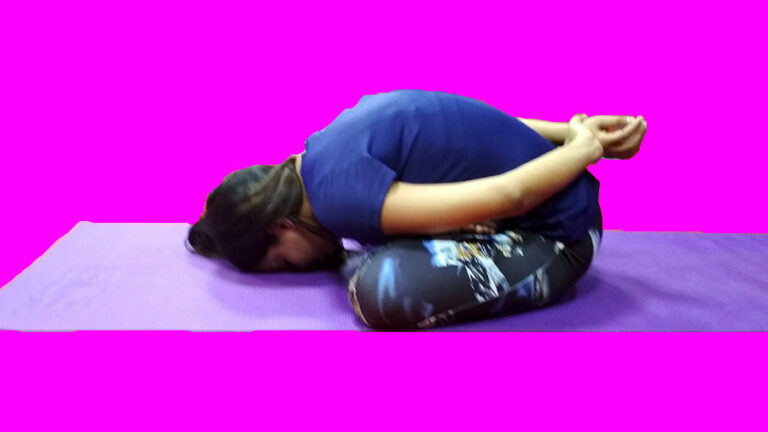 The Psychic Union Pose practice is very good in alleviating stress and curing mild depression. The regular practice of this asana improves the lung capacity and helps in alleviating respiratory disorders.